If you've read any 2018 SEO-trend articles, you know that voice search is the wave of the future. Though it may not completely eradicate screen-based searches, it will change the way users interact with content and the way search engines crawl, index, and retrieve website information. When a user interacts with his or her voice assistant, the device reads back a single, definitive answer to the query. The equivalent for a screen-based search is the featured snippet—the answer box at the top of the search engine results page (SERP)—which shows up for about 30% of searches, according to a 2017 study. And to be the single result for a voice search, your content has to be the featured snippet result. Note: If you work in marketing, I highly recommend tuning into our Pro Webinar series, where we often go over tips, tools, and examples of how to use data to inform your marketing strategy. 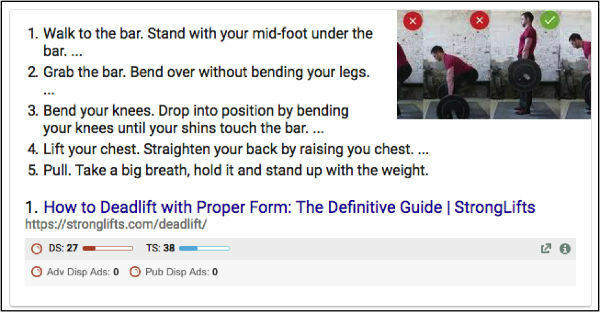 Gaining and retaining a query's featured snippet builds credibility. It not only increases visibility and exposure but also inspires a sense of authority and trust as Google's chosen source of information. Paragraphs. This type of featured snippet most often appears in question-based queries and it is the most common of snippets. To ensure that this type of snippet doesn't diminish your clickthrough rate (CTR), answer the question within the first paragraph of the page and include information that entices the user to click through to learn more. Lists. List snippets often feature results such as how-to content, recipes, ranked lists (e.g., top schools in an area), or unordered lists (e.g., things to do in a specific destination). The plus side to this type of snippet is that users must click through to see all of the information. Tables. Table snippets are more popular than you might think. They often appear in search results for lists, pricing, rates, and data. With tables, Google gives itself the freedom to format the table by pulling only the specific information the user is searching for. To rank for this featured snippet, bigger is better: By having more than four rows to your table, you'll increase the likelihood of clickthroughs. Table data is harder to extract for voice search, however. According to Google estimates, by 2020 fully half of searches will be voice-based. The widespread acceptance of Amazon Echo, Google Home, and the like has increased massively over the past two years as homes become more automated and voice search becomes more fine-tuned. In fact, it's estimated that smart speakers will be in 55% of US households by 2022. The rise of voice search means that marketers need to place a high priority on long-tail keywords and focus on natural, spoken language and a conversational approach. Although Moz's Dr. Pete recommends that SEOs and content marketers not focus on voice search alone or throw in the towel on their other efforts, he also explains that focusing on writing content for the kind of questions users ask in your industry can benefit both voice- and screen-based searches. Many featured snippets come from question-based searches, and most voice searches are being phrased in the form of a question. For your new content to rank well enough for a featured snippet, focusing on writing content for long-tail keywords can bring the best results. Often, long-tail keywords bring in less traffic, so marketers shy away from them. However, the traffic they do generate is in pursuit of something very specific; if you have the exact answer the user is looking for, he or she is more likely to convert. So focus on answering the specific questions that people ask about your product, service, business, or industry. To figure out what people are asking, think about the FAQs that you get from both potential and current customers that could be answered in long-form content on your website. You can research what people ask online through Answer the Public, listen to call recordings to determine what questions aren't currently being answered by your website, and check your Search Console to determine what queries you have impressions for but not clicks. Another beneficial tactic is what Moz calls tangential content. By playing down the direct promotion of your own products or services, you'll reach a wider audience, and the content will have a higher chance of getting inbound links, Moz has shown. If a pool company writes a blog post on summer pool safety tips, more people are likely to share that with their friends and family than a post about how great the pool servicing prices are. People searching for pool safety information are also more likely to come across this blog post in voice search and featured snippet results because it's not about the company as much as it is an answer to an important question. To learn about new ways to research potential long-tail keywords and tangential content ideas, check out this keyword research article on Marketing Profs. If you already have content created in hopes of having it featured, but it's remained stagnant, it may be time revisit and revise that content. Most marketers refer to that method as the skyscraper technique, but because I was raised as an artist I refer to it as a Picasso technique: Steve Jobs attributed the quote "good artists copy, great artists steal," to Pablo Picasso. I don't mean disrespecting copyright, of course. When good content creators copy, they make sure the reader is reminded of the original work and can easily trace the work back its origin. Though that approach may have success, it lacks original thought. Great artists, however, steal: They take the information, but they breathe new life into it—making it their own. Because the skyscraper/Picasso technique means adding to old content and making the new content better than the original, it makes that content the authoritative word on the matter. Do you answer the key question quickly and concisely within the content? Are there new and relevant articles on your site that can link to the older piece of content? Is your content the most thorough answer to the user's question? When aiming for featured snippets, circle back to your understanding of core practices: Continue a methodical practice of technical SEO, create shareworthy content, and monitor metrics for success. With keyword research that's based on an understanding of user queries and voice search nuances, you can get planning and creating content that's worthy of "position zero" down to a science—and reach your target audience. Melissa Garner is based in Atlanta, where she's taken her art marketing background and love for detail and analysis to join CallRail's marketing team as the SEO Specialist. CallRail provides lead tracking and call analytics tools for more than 75,000 businesses. Want to know where your leads are coming from and how qualified they are? Sign up for a completely free 14-day trial of CallRail's award-winning software. No credit card needed.